Welcome to the year 2015: where everyone should be offended by everything that happens no matter how small or little that something is. We’ve seen so much outcry about numerous things outside of the NFL that have ruffled some feathers here in there amongst many people around the globe. But that’s not what this article is going to be about. After all this is a sports page. 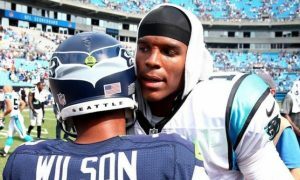 Sunday afternoon, the Carolina Panthers starting quarterback Cam Newton got under the skin of a mother and her 9-year-old child last Sunday afternoon when the Carolina Panthers took on the Tennessee Titans in Nashville. The Panthers would route the Titans in a 27-10 victory. What Cam did on the last scoring touchdown in the 4th caught the eye of Rosemary Plorin and her 9-year-old daughter. Rosemary took it upon herself to write a letter addressed to Cam. Below is what she had to say. “Because of where we sat, we had a close up view of your conduct in the fourth quarter. The chest puffs. The pelvic thrusts. The arrogant struts and the ‘in your face’ taunting of both the Titans’ players and fans. We saw it all. “I refuse to believe you don’t realize you are a role model. You are paid millions of dollars every week to play hard and be a leader. In the offseason you’re expected to make appearances, support charities, and inspire young kids to pursue your sport and all sports. With everything the NFL has gone through in recent years, I’m confident they have advised that you are, by virtue of your position and career choice, a role model. “And because you are a role model, your behavior brought out like behavior in the stands. Some of the Panthers fans in our section began taunting the hometown fans. Many Titans fans booed you, a few offering instructive, but not necessarily family friendly, suggestions as to how you might change your behavior. Ok, perhaps he was rubbing in the victory to the Titan faithful and players. But here’s what I have to say about this whole thing: it’s not that big of a deal and here is why. There are two parts of football: the physicality that you see, and then there’s the mental aspect of the game, the part of football that you mostly don’t see or hear. If Cam dancing the way he did in the end-zone offends someone, how about that person tune in to what the Titans d-linemen and linebackers probably said to Cam while he is under center and after every sack he took. Below is probably the best example of what is probably being said to Cam before every play and after. Below is a scene from the movie Any Given Sunday. Fast forward to 1:45. Here’s another part of the letter that is a bit weird to me. Ok. Cam thrusting and whatever have you for about 5 seconds offended you, but the women that barely have clothes on and have been shaking their behinds and chest all game long doesn’t, and that’s what you redirect your daughters attention to? I guess that makes sense. Maybe you should write a letter to the cheerleaders and how her daughter is now looking up to them as “role models”. This seems like a double standard to me. I’m guessing this woman never saw Terrell Owens or Chad Johnson/Ocho-Cinco play football before. Far more worse things happen on the gridiron. Cam dancing, in my opinion, isn’t that big of a deal and should be the last thing that someone should get upset about, especially the opposing players if they had been taunting him all game long. If what Cam did offended you, perhaps you should never go to another pro/college football game ever again. Taunting is a mental part of the game, and that’s what both teams do to each other. If you don’t like it, don’t watch it. This woman obviously doesn’t understand the game.